Filmed images dominate our time, from the movies and TV that entertain us to the news and documentary that inform us and shape our cultural vocabulary. Crossing disciplinary boundaries, Fields of Vision is a path-breaking collection that inquires into the power (and limits) of film and photography to make sense of ourselves and others. As critics, social scientists, filmmakers, and literary scholars, the contributors converge on the issues of representation and the construction of visual meaning across cultures. 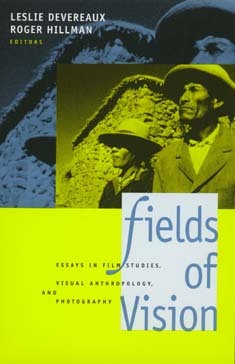 From the dismembered bodies of horror film to the exotic bodies of ethnographic film and the gorgeous bodies of romantic cinema, Fields of Vision moves through eras, genres, and societies. Always asking how images work to produce meaning, the essays address the way the "real" on film creates fantasy, news, as well as "science," and considers this problematic process as cultural boundaries are crossed. One essay discusses the effects of Hollywood's high-capital, world-wide commercial hegemony on local and non-Western cinemas, while another explores the response of indigenous people in central Australia to the forces of mass media and video. Other essays uncover the work of the unconscious in cinema, the shaping of "female spectatorship" by the "women's film" genre of the 1920s, and the effects of the personal and subjective in documentary films and the photographs of war reportage. In illuminating dark, elided, or wilfully neglected areas of representation, these essays uncover new fields of vision. Leslie Devereaux is Lecturer in the Department of Archaeology and Anthropology, and Roger Hillman is Senior Lecturer in the Department of Modern European Languages, both at the Australian National University, Canberra.